Summon: Permanently Shackle another friendly creature to draw an action of your choice from your deck. 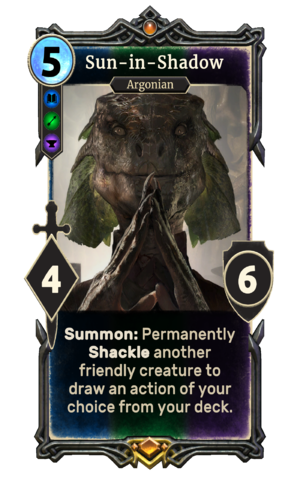 Sun-in-Shadow is a unique legendary House Telvanni creature card. It is part of the Houses of Morrowind expansion. "We must count on our wits." "Nothing will stop my rise."